Fiberglass vs. Thermoforming Process - How to Choose? - Productive Plastics, Inc. Productive Plastics’s core competency is the design, engineering and manufacturing of custom heavy gauge plastic thermoformed parts. Compare fiberglass and plastic thermoforming processes, review data on part weight and production time differences, get tips on converting from fiberglass to thermoforming, and more. Request Productive Plastics’ Fiberglass to Plastic Thermoforming Comparison and Conversion Guide (PDF) now for instant download. Productive Plastics works with customers to make sure the technology, production processes, and materials are right for each job. Here are some guidelines and considerations for deciding between thermoforming and fiberglass molding (FRP/GRP). For more information on matching the ideal industry compliant thermoplastic with your project’s needs, please contact us. The thermoforming process, on the other hand, is highly automated, relatively simple, and typically requires less labor. Most applications utilize only a single tool per part. 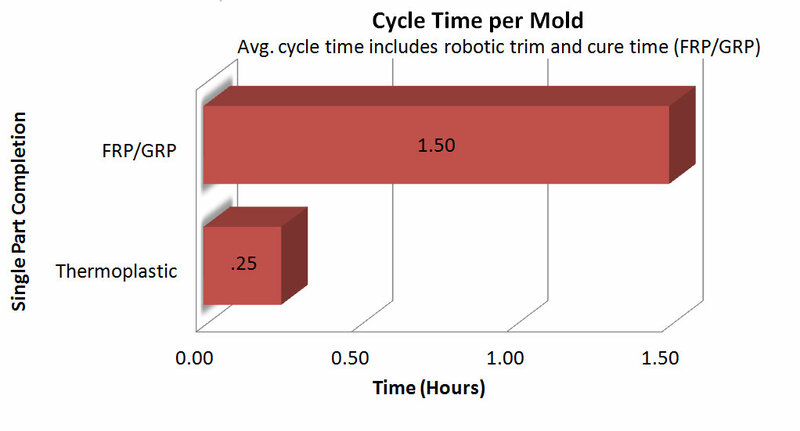 Consequently, lead times tend to be shorter, and the tooling and labor costs reduced when compared to the fiberglass molding process. 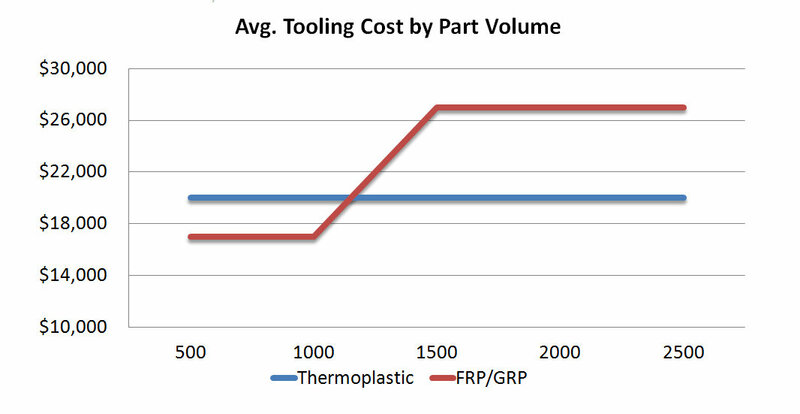 From a purely process perspective, thermoforming is often both faster and cheaper than the fiberglass counterpart in smaller production volumes of 250-3000 parts annually. Productive Plastics completes tooling and first production runs, on average, in less than 10 weeks. Thermoformed plastic parts are lightweight and can offer substantially reduced part weight when compared to fiberglass. Typical thermoformed parts are, on average 30% lighter than their fiberglass counterparts. A fact reinforced by comparing specific gravity weights of raw material product on industry material provider websites from companies such as Covestro (formerly Bayer MaterialScience) or SEKISUI SPI (formerly KYDEX,LLC). There are many advantages to using thermoformed plastic in place of fiberglass parts. Whether converting an existing fiberglass part to thermoformed plastic or creating a new one, Productive Plastics has the experience and expertise in design, engineering, and lean manufacturing to meet the needs of even the most challenging projects. Please Contact Productive Plastics to start the process of converting a plastic part from fiberglass to thermoformed plastic. There are some circumstances where other manufacturing processes such as fiberglass molding are a better choice. These circumstances include high strength and very complex designs. Please Contact Productive Plastics for assistance with choosing the best process. Please Contact Productive Plastics, one of the most innovative thermoforming companies, for assistance or to get a quote for custom plastic thermoforming contract manufacturing or to explore the option of upgrading fiberglass parts to thermoformed plastic parts. 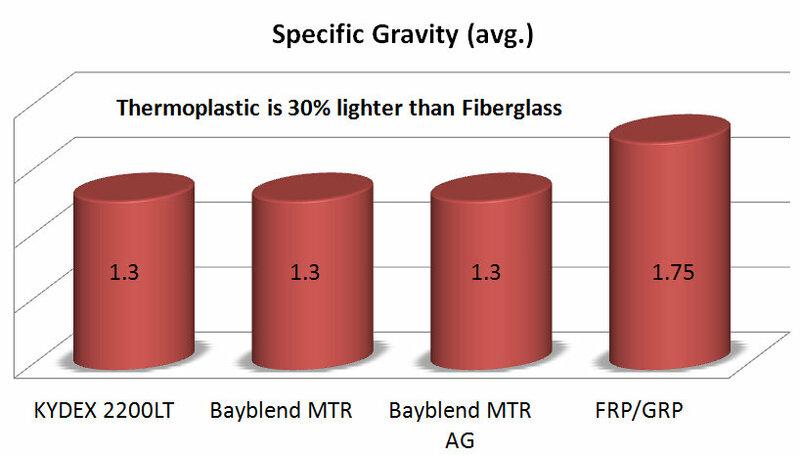 Request a free Productive Plastics’ Fiberglass to Plastic Thermoforming Comparison and Conversion Guide (PDF) from Productive Plastics. Request a free Heavy Gauge Plastic Thermoforming Process and Design Guide (PDF) from Productive Plastics.